Looking for the cleaner Rockdale homes and businesses have relied on for more than a decade? You’re in the right place! At Merit Cleaning, we have offered high-quality, low price residential and commercial cleaning Rockdale and Sydney residents love for 10 years. We combine the rigorous approach of the most professional cleaning company with the communication and friendly demeanour of a family team. Next time you need some cleaning done at your residential or commercial property, call the cleaner Rockdale residents are happy to welcome into their homes. Fully insured and police checked, you can rely on Merit Cleaning. From strata cleaning to office jobs, Merit Cleaning provides the commercial cleaning Rockdale managers have turned to for many years. We will come into your commercial building or office and maintain its high standards through meticulous washing, vacuuming, polishing, wiping, scrubbing, and more. From desks to doors, kitchens to bathrooms, we offer a complete solution for offices. Our services will help keep your commercial building up to code while ensuring an optimal environment for workers, clients, and customers. If a tidy desk means a tidy mind, then we provide the commercial cleaning Rockdale workers need for increased productivity. For a cleaner in Rockdale that will take care of all your house cleaning needs, trust the experts at Merit Cleaning. From kitchens to bathrooms, bedrooms to common areas, we can do it all. 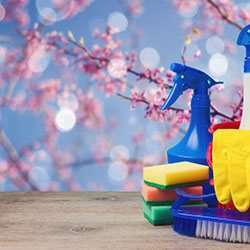 You can rely on Merit Cleaning for once-off bond cleaning, yearly spring cleaning, or for more regular house cleaning services. Whatever you choose, you can be guaranteed of a job well done and no lock-in contracts. Find a cleaner Rockdale homes can hire in a hurry! For residential and commercial cleaning, Rockdale residents can call us on 1300 063 748 or contact us online.